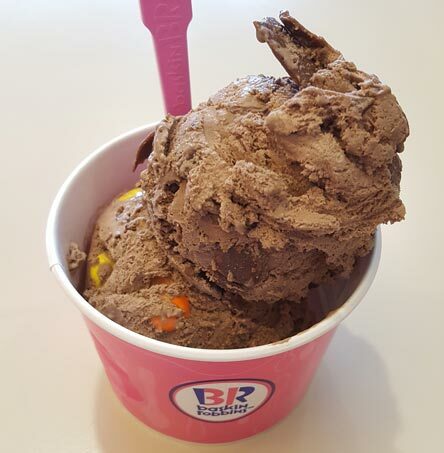 I don't track Baskin-Robbins enthusiasm from day to day, but there seemed to be an awful lot of excitement for this flavor. Now that I have had it, I can say that while it doesn't taste as good as it sounds, it is still very enjoyable. I happily devoured this treat though I don't know if I will rush back for more. Let's get in to the specifics. First off, I got to be the first person to dive in to the tub of 3-Pointer sitting behind the glass. I should have grabbed a picture as there were just a few Reese's Pieces sticking out but more importantly you could see this imposing looking swirl trying to break free from the tub. Here is the ice cream from another angle. Notice the giant slabs of the pb and chocolate ribbon. The always nice lady behind the counter scooped those out and threw them on top for me. I was grateful to get that added peanut butter boost to start my lunch (yes, this was my lunch). See, to me, the swirl is the star of this show. While it tastes more like peanut butter than chocolate, it was very plentiful and did it's best to add some peanut butter flavoring to every bite. "But Dubba, it has Reeses pieces to add pb flavor right?" After having this ice cream, I don't think regular size Reese's pieces actually work that well in ice cream, at least not in this particular chocolate ice cream anyway. While they were quite plentiful, they are fairly hard and I couldn't taste them over everything else. I think I would rather have mini pieces instead, that way I would get some added texture but not risk being overwhelmed by it. "Ok, but what about the peanut butter cups?" Well, those aren't what you would expect either. They are actually chunks as opposed to say mini pb cups. In a few cases I found a peanut butter center without a chocolate shell (You can actually see them in the stock photo for this ice cream). The chunks wound up being quite soft and barely noticeable while competing against all the Reese's pieces. 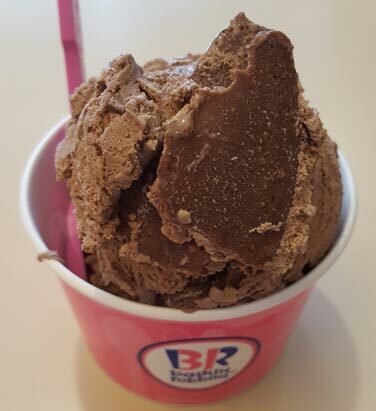 The chocolate ice cream base has been referred to as serviceable and that's probably a good way to describe it. The bites without swirl weren't that exciting, so I kind of aimed for a bit of swirl in every bite which then dominates the base so. Or if there is no swirl, they'll be a one or two Reese's pieces which will then serve as the distraction for that bite. I guess it's main purpose is to keep this one from being too peanut buttery. The base works to dilute the overall pb vibe quite a bit actually. Hopefully you have a better idea of what this one is like... or you are banging your head on your desk... or you are grabbing your keys because you need to just analyze this one yourself. If I had to sum it up, it's enjoyable if not perfect. I wanted all the peanut butter elements to be a factor. Well, technically the swirl is a huge factor, but I wanted that salty, gritty Reese bite to be a huge factor and it's not. You can't go in expecting a pb cup, or even a nice 50/50 split of chocolate and peanut butter because that's not what this is, but hopefully you will still enjoy something different here. Good luck and check back in if you try this one. History Note: Aleksandr has reminded us about the original "3-Point Chocolate" which debuted in March of 2012. It too was a chocolate base but incorporated a salty caramel swirl and orange-colored caramel pretzel balls. Mmmmm pretzels. So much potential. I agree with you on the reese pieces part. If you do scoop shops, will you review B&J's cereal milk scoop shop flavors? I don't know about you, but I'm very intrigued. @aol: I do hope to make it to a B&J in the near future, i'll probably get a double scoop and then try 2 of the 3 flavors. @Aleksandr: I added a note in the review!